Due to the capacity to shift price in variations, we've decided to reorganize our sample tea listings. Unfortunately, given the limitation in variations and the sheer number of teas we have, there will still be multiple sample listings. This listing covers our Simply Tasty Teas with names in the final third of the alphabet (Q-Z). These are teas that were created with good taste being the primary goal. Posts with more information on the teas can be found on our website. We offer our samples as both 5 servings of loose tea and as 5 teabags. 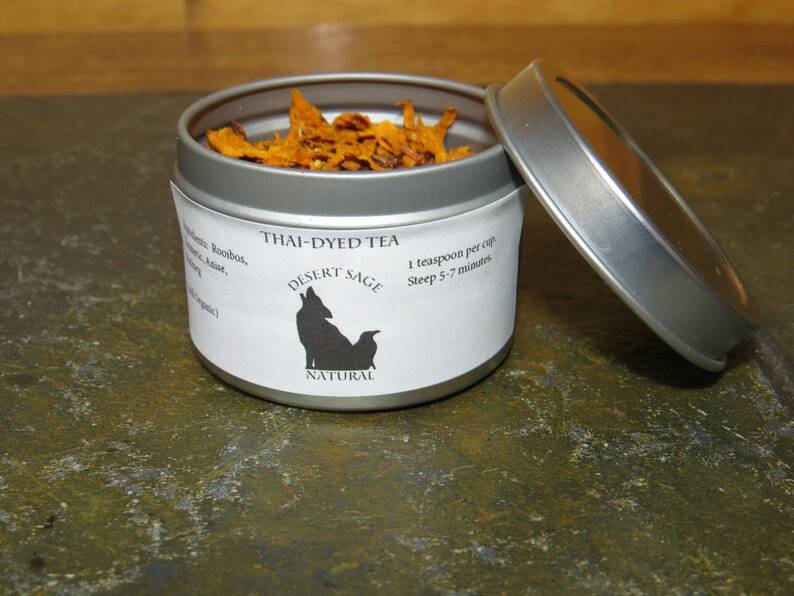 If you would like to read the full story of this tea and how it was named, please visit our website. For our international customers – a phone number is required for us to be able to ship to you. Please make sure to include this information with your order, or in a separate message. If you would like to see the full selection of our teas, with all options available, please visit our website. We can offer many of our teas using decaffeinated tea, or create an herbal companion tea with a similar flavour profile. If you would like to see one of our teas offered without caffeine, please contact me. We do not offer all of our teas and coffees in the larger LatchTins – but we are willing to set it up for any of them. If you are interested in one of our products in a larger quantity, please contact me. We are not officially attached to or licensed by or otherwise involved with any of the official agencies of the fandoms we homage. If any of these agencies have an issue with our teas, please let us know, and we will work things out. I am so grateful to have discovered your teas! Simply incredible in every way-from packaging to sipping and sharing! The most nurturing tea experience. A gift from start to finish. Thank you. So delicious I have been dreaming about it all day ever since I enjoyed my first cup this morning! Thank you!! Your packaging is exquisite and your personal note was deeply appreciated. For the most part, we prefer Paypal. However, if there is another method you would rather use, please contact me directly, and we can figure something out. We do our level best to make sure no damage will occur in shipping. However, if there is a problem, please let me know within a day or so of arrival, and we will see what can be managed. Beyond that, refunds and returns are a bit odd with things like herbal preparations - especially teas. However, our priority is you (with the hope of managing something resembling a living eventually), so if there are issues, let me know, and we can discuss a solution. For the time being, all of our orders are shipped via the USPS. Usually, they are sent first class. Occasionally priority mail is forced due to package size, for larger orders. If you wish to receive something with a faster guaranteed speed, please contact me directly. The other primary important note is that we cannot easily estimate the amount of time an order will spend in customs. Additionally, any duties incurred on the other end are the buyer's responsibility. Most of this is comon sense, however, the modern world is fairly litigious, so.... All wrapped up together, here are the disclaimers that litigiousness requires of us. **I am not a doctor. The FDA (and a myriad of other agencies) have not decided that any of this is fact. While we draw on science as well, for the most part, even when there is research indicating the efficacy of herbs, they have not been formalized as treatment metholodologies. ***I am also not a psychologist or psychiatrist. No mood tea that I formulate is directly intended to replace any psychiatric medication. If you are taking any form of psychiatric medication, you should consult both me and your doctor before drinking one of our SereniTeas. The side effects and contraindications for practically all psychiatric meds are long and complicated, and I really prefer to look into them before suggesting a tea. ****Lastly, I am not a vet. I have studied texts written by holistic vets (most of whom either started in allopathic medicine, or use both methods in their practices.) I apply the same standard of research to my pet teas that I do the ones for their bipeds. This includes needing to know about any medications they are currently being given.